Not one month after Dolce & Gabbana staged a celebrity millennial-filled men&apos;s show in Milan, the Italian fashion house kicked things up a notch for its Alta Moda show in Naples on Saturday. As Domenico Dolce and Stefano Gabbana&apos;s answer to couture, the raucous event is known to spare no expense — both in terms of clothing and entertainment. This season&apos;s celebration mirrored that of a street festival, not unlike the brand&apos;s fall 2016 campaign, which captures local civilians alongside models. 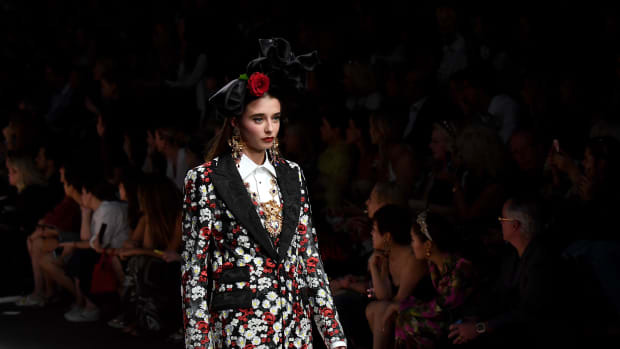 For Alta Moda, Dolce & Gabbana took over an entire stretch of the city, incorporating a brass band, fireworks and a gilded velvet bandstand where the evening&apos;s guest of honor, Sophia Loren, sat front and center. Loren has served as a muse to the Italian house for some time now, most recently appearing in the brand&apos;s latest fragrance film this past January. But this collection was explicitly inspired by the 81-year-old actress, who grew up not far from Naples and shot many of her classic movies there, as well. Indeed, all 30 of the larger-than-life looks were fit for a true Italian diva; each gown, tuxedo and bodice was more elaborately embellished and intricately detailed than the next. While we weren&apos;t there to watch the extravaganza unfold in-person, there was, of course, quite a bit of Instagram footage, thanks to the crowd&apos;s many VIP guests. Read on to see all the highlights from Dolce & Gabbana&apos;s Alta Moda show and wild weekend in Naples. Fourteen hours before its actual show. You can't miss the flock of soaking wet, shirtless men, either. The Italian fashion house launched a collection of traditional garments for its Muslim and Arab audiences.